Christmas Lollipops are a great idea for your next Christmas party. A festive addition to the one day of the year you can deck the halls with bows of holly. These red, white and green lollipops are also perfect for the corporate occasion. Use them for a Christmas Day treat or stocking filler. 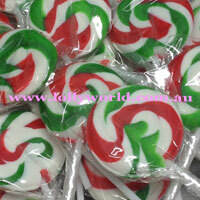 A 15g peppermint flavoured lollipop that is individually wrapped, and are roughly 5cm in diameter.